“We’re dressed like zombies because the tuition is killing us!” said the students who interrupted a Board of Regents meeting last Wednesday. 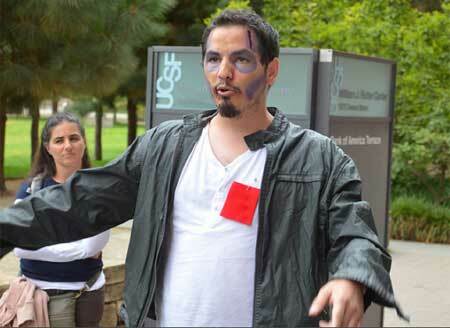 In face paint and torn clothes, the zombies protested yet another round of fee hikes – 6 percent this time -- being considered by the regents. The fee hike would take effect if Gov. Brown’s tax initiative on the November ballot fails. “Is the UC system starving the humanities?” is the title of an opinion piece by the Sacramento Bee’s retired editorial page editor, Peter Schrag. Schrag notes increasing concern among UC faculty that humanities departments are being defunded while tight budget dollars are directed toward the more lucrative sciences and business. As if to punctuate the faculty’s concern, UC announced that it will move ahead with construction of a 250-room hotel and conference center for the UCLA campus, at a cost of $125 million. The project is controversial in part because the complex would not be open to the general public. The ACLU has filed a Freedom of Information Act request to investigate whether the FBI has been spying on UC Davis Occupy protestors in the wake of last November’s pepper spray debacle.